The Importance of a Responsive Website #infographic ~ Visualistan '+g+"
A huge proportion of website traffic is now made up from mobile users, in fact 55% of overall internet access is accounted for by mobile users. The improvements in smartphones have been a catalyst for the switch from people predominantly using desktops to them now using their smartphones to access the internet. Through apps and mobile friendly websites, people can now easily access the internet to do everyday tasks such as checking emails, browsing social media and even online shopping. The iPhone was first launched ten years ago and since its launch, more and more people have switched over to smartphones each year. 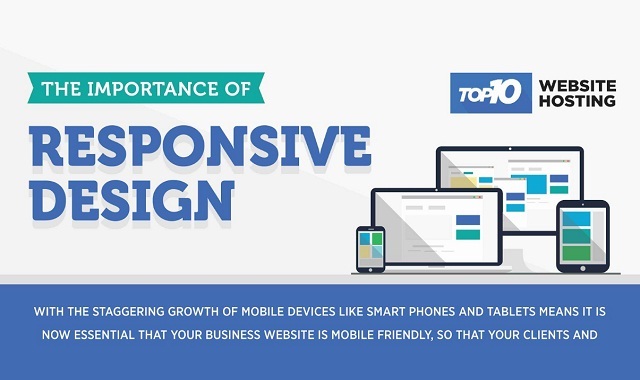 If you take a look at this infographic The Importance of a Responsive Website, you will see the figures for mobile and smartphone users across the world. In the UK, 97% of the population (aged 16+) own mobile phones and of that figure, 61% have smartphones. South Korea is even more advanced with 99% having mobiles and 67% with smartphones. Those are quite huge figures and show just how far the world moves on in a decade. So with this huge shift in the way people access the internet, there is also a need for the way that websites are developed to cater for this. Website development has also progressed significantly within this period and mobile users now expect a website to be mobile friendly, as you can see in the Top10 Website Hosting infographic, 52% of users said that a bad mobile experience made them less likely to engage with a company. So you could be missing out on a lot of business if you don’t have a responsive website. Over the next few years, even more people will be accessing the internet through smartphones, so make sure that your website is set up to provide a good experience in terms of web hosting performance and being mobile friendly.